Above: Postcard published by P. A. Buchanan & Co Ltd – undated. 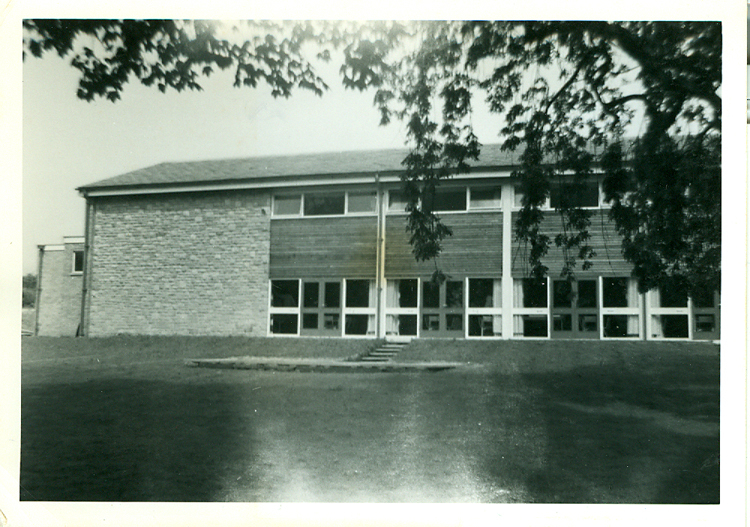 When the Dining Hall transferred to the new Stopford Hall in 1963, it then became the Biology Laboratory. Postcard supplied by Kathryn Dickens. 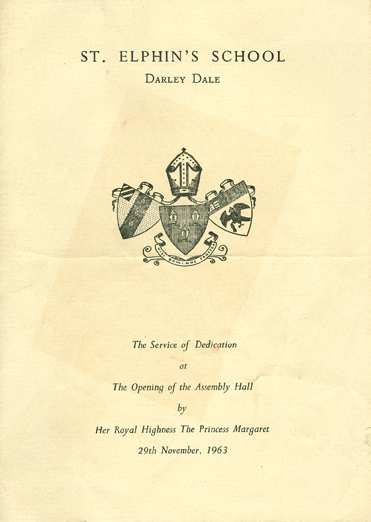 The Opening of The Stopford Hall, also known as The Assembly Hall, which was used as the main dining room from November 1963, was a major event for St Elphin's – mainly because Her Royal Highness, The Princess Margaret opened the hall. 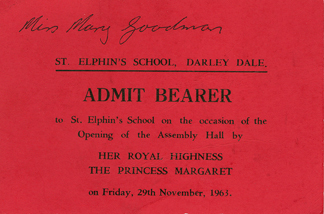 This was the first Royal visitor in the school's history. The invitation and Service of Dedication were supplied by Mary Goodman. Read more about the Service of Dedication. The photos below were supplied by Betty Steggles (nee Royle at St Elphin’s from 1961/2 to 1966) now based in Ontario, Canada. Everyone was dressed in black to mark the mourning of John F Kennedy, President of the United States of America who had been assassinated. 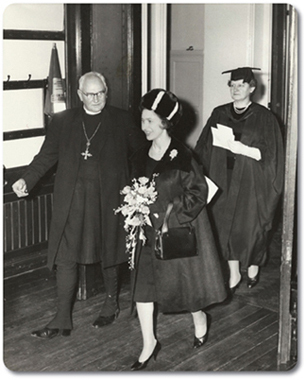 Below Left: Her Royal Highness, The Princess Margaret, Countess of Snowdon with Miss P M Robinson, Head Mistress from 1958 to 1975 and the Bishop of Blackburn. 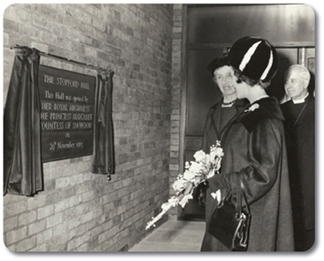 Below right: Her Royal Highness, The Princess Margaret, Countess of Snowdon opens The Stopford Hall (new dining room) on 29th November, 1963. A proud Miss Stopford, Head Mistress from 1941 to 1958, looks on. 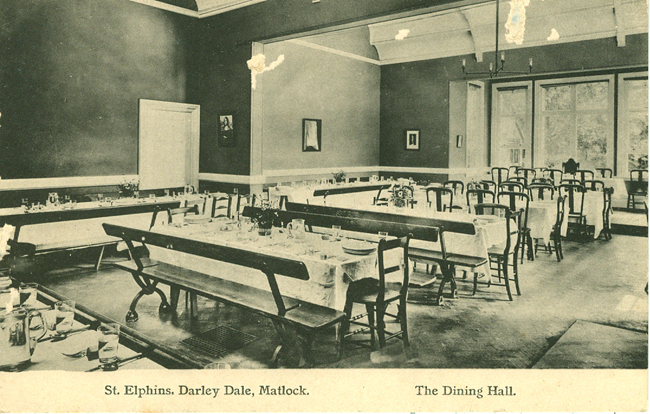 Photos: Central Press Photos Ltd.
Below: The Stopford Hall (dining room), taken in 1965 (approximately) by Liz Mumford Hall (1961-1968, Powys). Unfortunately, The Stopford Hall was demolished post 2005 as the brickwork didn't match up to the stone of the main school building.